When it comes to fine dining, this upmarket venue in the heart of modern downtown West Palm Beach, offers premium handcrafted cocktails and the best of Ruth's Chris Steak House food and signature service. We all know what to expect when you go to Ruth’s Chris, the quintessential steak house that has been around for 50 years. They have the best USDA prime steak in their food menu, amazing service, and gracious hospitality—the outpost of an unparalleled dining experience. The Ruth’s Chris Steak House in West Palm Beach in particular has a unique flair. Their convenient location across from the spectacular Kravis Center for the Performing Arts and being just steps away from CityPlace, the city’s entertainment hub, makes this restaurant a preferred stop where locals and visitors congregate over reasonably priced cocktails and comestibles. And Ruth’s Chris staff at 651 Okeechobee Boulevard enjoys playing host and serving it up! Recently, I was invited to dinner by their general manager, Adam Kaytes, who gave me a grand tour of the restaurant. It has three floors aligned with tables at either side, each with a remarkable view of Okeechobee Boulevard. We sat at table number 40, which provided a bird’s eye view of the entire place. It’s not surprising that their guests keep coming back to their preferred tables that are perhaps attached to a romantic story like a couple’s first date, anniversary, wedding proposal, or even a treasured memory between father and son, or a business deal that made history right there. “When a person or party makes a reservation, we like to jot down a special note that includes things like their favorite table so they can have a fine dining experience, which is after all, our primary goal,” said Kaytes. I had not paid a visit to Ruth’s Chris in some time, so I wanted to get a bit of a taste of different cocktails and appetizers before our entrée arrived. To start off the night, I had a Mojito, one of my favorite cocktails. While savoring my refreshing concoction, I looked over at their extensive and award-winning wine list and Kaytes helped me select a Pinot Noir from the Anderson Valley Vineyard in California. It paired perfectly with our dinner. While enjoying the subtle but fabulous kick of the wine, Kaytes chatted about the founder of Ruth’s Chris and her historical beginning that dates back to 1965 in New Orleans. Since then, this restaurant chain, which is considered one of the largest in the world, has multiplied, now owning over 100 restaurants in the country. But their tradition to have “emotional connection, the finest ingredients and food quality, plus superb service,” remains unchanged. What they do is meat and potatoes, but it’s the best meat and potatoes anyone can have. Ruth’s Chris in West Palm Beach is classy and chic, a mix of old and new. Bold colors accentuate this statement. They cater to parties in their main and private dining rooms. The private room seems to accommodate parties of 80 or more, and looks fittingly for birthday celebrations, weddings, and other private engagements, including business meetings. Kaytes said the room is also opened for a la carte dining when the restaurant reaches maximum capacity. I learned that every season they have a new home made side dish menu with fresh items, things like sweet cream corn, roasted tomato and crab soup, which compliment their different signature cocktails, huge steaks, prime cuts, and Maine lobster dishes. I couldn’t decide if I was in the mood for steak or seafood, but really, if you go to Ruth’s Chris Steak House, the choice should not be that difficult. Kaytes and I decided to go for one of their delicious steaks, the Porterhouse for Two. Any cut you choose is fresh, never frozen. The steaks are actually cooked in a 1600-degree oven that their founder designed herself. It’s always been the same recipe but with just a new twist. Salt, pepper, parsley and cooked in a little butter. When their sizzling steak has finished cooking, it is placed on a 500-degree plate, so the entrée is hot all the way to the last bite. As different appetizers began to be served, Kaytes and I sampled each one with great gusto. West Palm Ruth’s Chris Head Chef Kendris Candelario could go nose to tail against the country’s best chefs and come up on top. First, the Veal Osso Buco Ravioli, a saffron-infused pasta filled with veal osso buco and fresh mozzarella cheese topped with a white wine demi-glace. Kaytes suggested I take a sip of the red wine between each bite, as this would accentuate its distinctive taste. He was right. 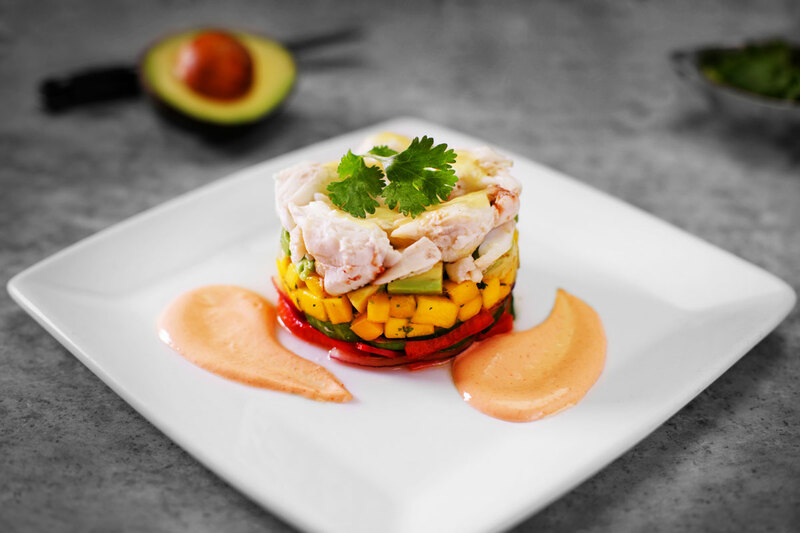 The Crab Stack that was served, a colossal blue crab peaks atop a mild medley of avocado and mango, combined the sweet and savory flavor in every bite. The last of the appetizers included the Spicy Shrimp—so delicious I simply couldn’t just have one. This succulent large shrimp, is lightly fried, tossed in a spicy cream sauce, and served with a tangy cucumber salad. Simply sinful, and absolutely yummy. What I loved about the above appetizers is that each had a distinct, but not overwhelming spice—very easy on the palate, especially after taking a sip of the red wine. It magically made all the fresh and finest ingredients taste exceptionally delicious. Finally, the Porterhouse was served. A whopping 40 ounces of prime beef with the rich flavor and tenderness of a filet cooked to order—medium rare. Kaytes had warned me before I tasted it that once I took a first bite of this perfectly prime cut, I was going to be spoiled, as it is the best of the best. Once again, he was right. “It [all the steaks] represents the top 2-3% of cattle, and they are hand-selected for thickness and tenderness,” explained Kaytes, who recalled the founder’s southern hospitality, who only served her guests the finest custom-aged USDA Prime beef. The sides such as the all-time favorite, the Sweet Potato Casserole—whipped sweet potatoes topped with a savory pecan crust—are big enough to share. As the friendly staff at the restaurant told me, there’s no better way to end a delicious meal than with a delectable dessert, I ended my Ruth’s Chris experience on a high note. 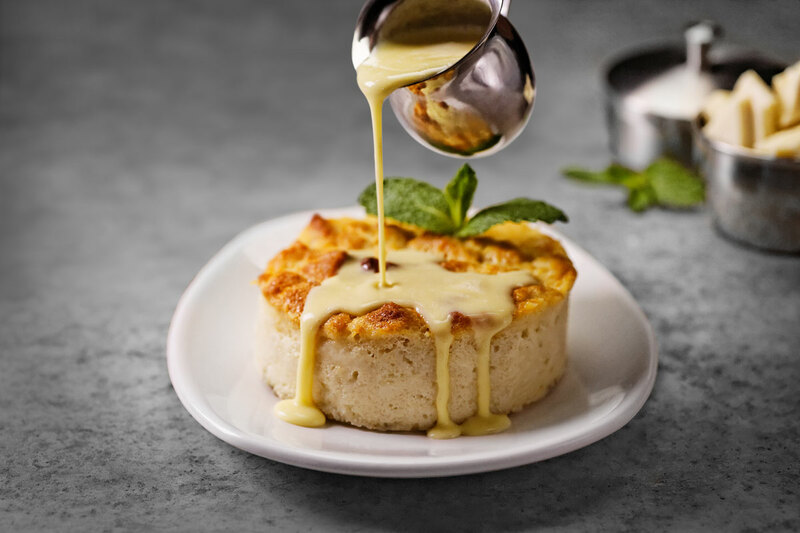 I first indulged in the White Chocolate Bread Pudding, a heavenly house-made classic topped with a choice of four spirited crème Anglaise sauces: Orange Cognac, nutty Frangelico®, raspberry Chambord® or coffee Tia Maria®. I tried all four, and my favorite was the coffee Tia Maria. Another dessert creation I was happy to savor was the Chocolate Duo, a chocolate cake coupled with chocolate mousse splashed with a little sweet cream and topped with fresh berries. I left the Crème Brulee for last on purpose and was delighted to see that Ruth perfected this classic Creole egg custard herself, now considered one of the best in the world. I’ve heard it say that at Ruth’s Chris, your last bite is just as good as your first. And talking like a true southerner, “By and by, I reckon I couldn’t agree more.” This is one fine dining experience in downtown West Palm Beach, I won’t soon forget. If you want to indulge in quality food and good old southern hospitality, take a walk down to Okeechobee Boulevard and visit Ruth’s Chris Steak House. The best bet is the Ruth’s Chris special, which is a full course meal for $44.95, consisting of a starter, an entrée, a side, and dessert. Happy hours are rightfully named Sizzle, Swizzle & Swirl, featuring a cocktail list to please the most discerning crowds—from millennials to baby boomers, and seniors looking for fresh bevvies. 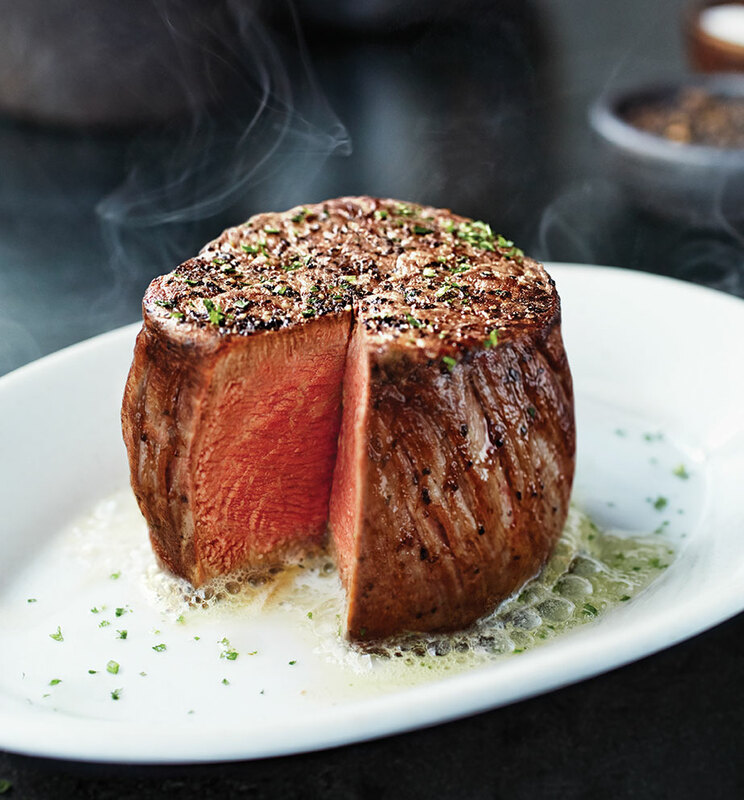 If you plan to visit Ruth’s Chris Steak House at 651 Okeechobee Blvd Suite 100, West Palm Beach, FL 33401, you may call (561) 514-3544 to make your reservations, or visit ruthschris.com for a look at the menu in advance. For a perfect fine dining experience in West Palm Beach, Ruth’s Chris Steakhouse in id=”152″ codes=”true”]offers fresh signature prime cut steaks and quality service.